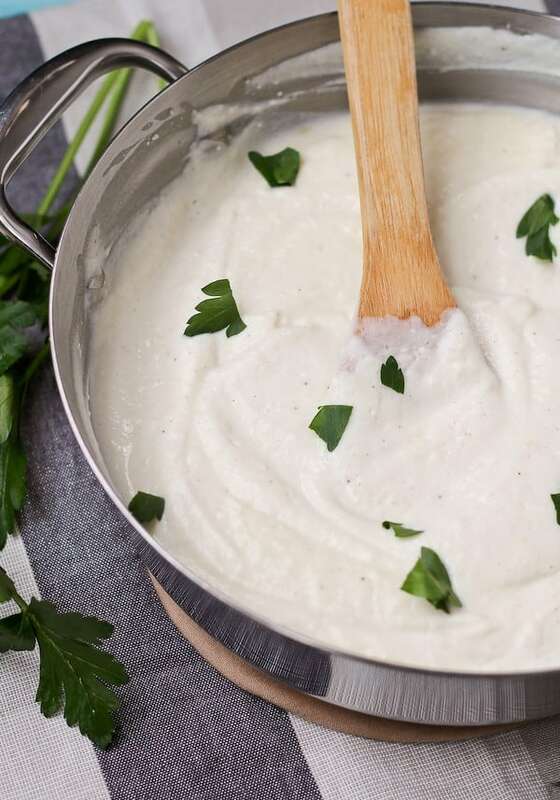 Trade out your beloved calorie-laden alfredo sauce for this skinny alfredo sauce made with cauliflower. You’ll barely be able to tell the difference! Alfredo. Along with marsala, alfredo is another one of my husband’s favorites. Fettuccine, chicken, shrimp, these are all minor details. It’s all about the CREAM, BUTTER AND PARMESAN. Of course, Ben is super health-conscious. It’s a little annoying sometimes. I mean, dude, put some mayo on your sandwich. Some sour cream on your taco. Some ranch on your salad. Some freakin’ brownie in your mouth. Life gets better with these things. He’s got the self-control I wish I had. He could make a package of Oreos last months (I KNOW!). My point is, he loves the alfredo, but he doesn’t often order it at restaurants because you know, 29,050,329,023 calories per serving. So what do I do? 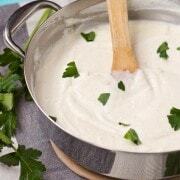 Make a skinny alfredo sauce. Made with cauliflower and blended until it is super smooth (that’s an important step! ), it’s almost a perfect mimic of the alfredo we all know and love. It still has some goodies in it — starting with the garlic sautéed in butter and olive oil (gotta have a little of the good stuff here!). The pureed cauliflower is blended together with milk, parmesan cheese, pepper, and a dash of nutmeg to compliment all that creamy goodness. The result? A sauce that looks, smells, and tastes like alfredo sauce. Except without the 248,395,289,253 calories. Sauté the minced garlic with the butter and olive oil in a large skillet over medium-low heat. Cook for several minutes or until the garlic is soft and fragrant. Be careful not to brown the garlic. Remove from heat and set aside. Meanwhile, bring a large pot of water to a boil over high heat. Add the cauliflower, cover, and cook until cauliflower is tender when you stick a fork in it (about 8-10 minutes). Drain. Transfer the cauliflower to the blender. Add milk, sautéed garlic/butter, salt, pepper, nutmeg, and milk. Blend or puree for 2-3 minutes until the sauce is silky and smooth. 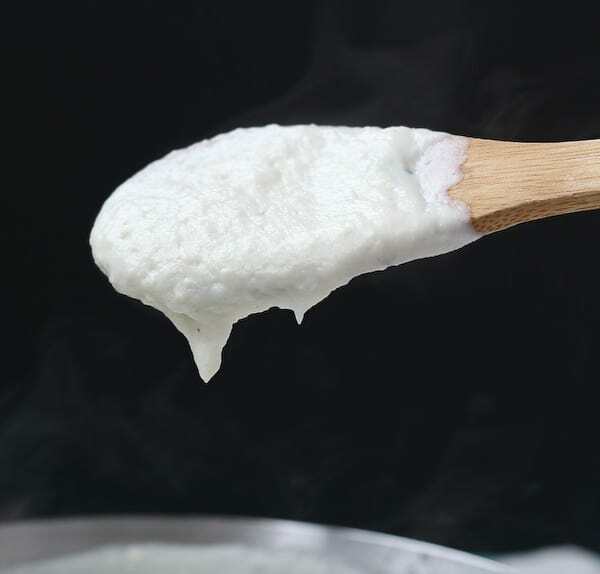 Stir in Parmesan cheese. You can add more milk if it seems too thick. Toss with your favorite cooked pasta and serve immediately topped with fresh parsley if desired. Verdict: I loved this skinny alfredo sauce. It will definitely be happening frequently in my kitchen. Husband’s take: Truthfully, the 4 garlic clove version of this sauce was a bit too garlicky for him (he’s not a huge fan of garlic). If you have garlic haters in your house, consider reducing the amount of garlic. My neighbor and her family loved this sauce though and had no problem finishing it off for us. Changes I would make: Less garlic for my hubby but other than that, none. Actual nutrition may vary depending on how recipe is prepared. 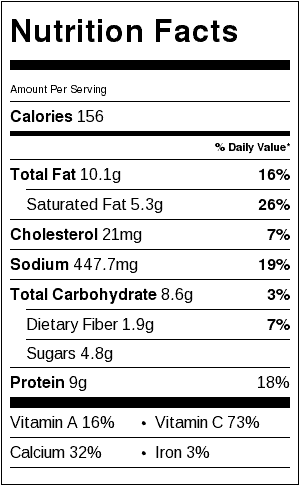 Nutritional information is for sauce only and does not include pasta. Looking for more pasta and sauces that won’t set you back millions of calories? 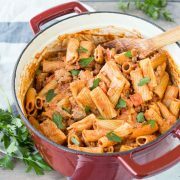 Try Vegan Bolognese, Whole Wheat Pasta with Broccoli and White Bean Pesto, Turkey Bolognese with Zucchini Noodles, Rainbow Chard, Turkey, and Gruyere Skinny Mac and Cheese, or Skinny Shrimp Scampi with Zucchini Noodles from Just a Taste. 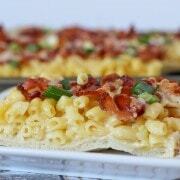 Im planning on making this this week but it seems that this recipe yields way more than needed. Any idea on how long this stays good in the fridge? Or can it be easily frozen and defrosted without losing any qualities? Thanks in advance! I haven’t tried freezing it, but I think that would probably work great! There is a possibility that it might separate slightly when it thaws. I’m sure you could also halve the recipe. And it should keep for at least a few days in the fridge. Hope that helps! What is a serving size? I want to try this and counting calories. Just made this for dinner. Absolutely delicious. Tastes just like regular Alfredo sauce, very rich and creamy. Delicious! Everyone in the family loved it. Hi Elizabeth! I’m so glad you all liked this recipe! Thank you so much for taking the time to come back and leave a comment! Just a little FYI. Not that anyone would forget to add it, but you do not have the Grated Parm(the cheese that makes this alfredo!!) listed in your cooking instructions. See step 3. Do you think you could substitute almond milk in for the skim milk? Has anyone tried this? I”d like to ask if it’s possible to sub out the milk and butter and insert vegan options such as coconut milk, or nut mylks and vegan butter and vegan cheese to make this a vegan option? I’m not vegan by choice, but I have a dairy allergy. I also know that when it comes to recipes, it’s all about the chemistry of the ingredients. From a chemical structure standpoint, is it possible to achieve this creamy alfredo-sauce without all of the dairy? PS. I gave up dairy almost 2 years ago, so if this works, I’d be happy to put this on my health and wellness blog. Just saying! I’ve never tried it with a dairy milk alternative but I think it would work! Let me know if you try it! I make a sauce like this all the time and just can’t get enough. I add Shirataki noodles to save more calories. It’s the bomb, even without cheese. OH MY GOD! I made this last night. It was beyond incredible! My husband and I both loved it! I swear if you didn’t tell anyone they’d never know it was cauliflower in there. And it wasn’t 29,050,329,023 calories! Thank you!!! It was so easy to make too! This comment totally made my day — thank you!!! So glad you guys liked it. 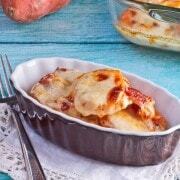 My husband’s favorite is pasta with Alfredo sauce and I love that you made a healthier version with cauliflower! It looks so creamy and delicious! Your description of you husband is hilarious– I’m laughing because he sounds exactly like mine. You have to keep your sense of humor about these things. I love Alfredo sauce too, and I’m excited to try this shinny version. Sounds divine! I’ve seen this cauliflower alfredo around for a while now and have yet to try it. Perhaps it is because I can barely make a package of oreos last a day. Hmmm, maybe I NEED to try this after all! That way I can have a whole package of oreos for dessert and call it even. cauliflower Alfredo is MY FAVORITE. I do not make it often enough, really. I am still laughing at the 29,050,329,023 calories. so true. and my husband sounds the same way. he thinks my ranch addiction is cute. he can forgo that brownie (but I *am* wearing him down, he does like the brownie). I’ve got to try this. I have to stop eating things that have 92 million calories. And I hardly ever eat Alfredo sauce anymore! Changing that now! Getting rid of the 90,956 million calories in alfredo is genius!!! This look so creamy and delicious! I can’t wait to try it!!! Ooooo I am SO intrigued with this! 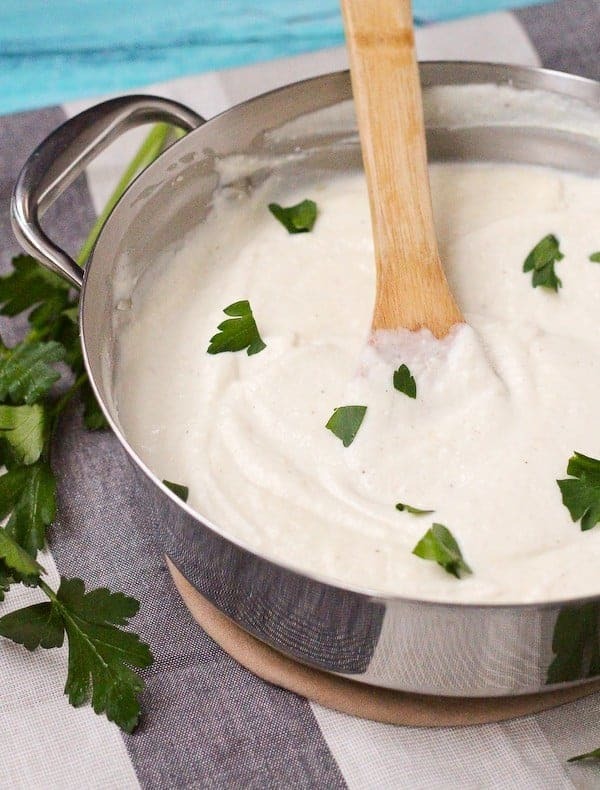 I’ve been wanting to try cauliflower albedo sauce for a while – this looks so good! Cauliflower alfredo is basically my life. I keep a batch in the fridge at all times, because you can really put it on ALL THE THINGS! Plus, the not having 589238092 calories is a HYOOGE plus ;) Pinned!